Established in 1902 during the gold rush, Fairbanks is located in the Tanana Valley of Alaska’s Interior. The second largest city in the state, the “Gold Heart City” is known for its historical and modern gold industries. 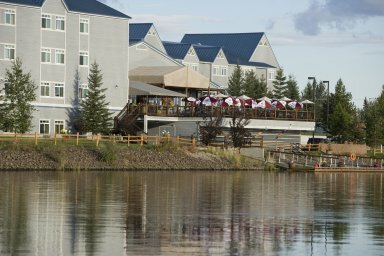 The Fairbanks Princess Riverside Lodge is the town’s most refined and ideally situated hotel, located on the on the banks of the Chena River. In the summer, Fairbanks experiences nearly 24 hours of light, creating some great opportunities for outdoor activities. Here are some of the town’s top attractions. See the Arctic Circle by air with an once-in-a-lifetime adventure. The flight will go over the Yukon River Valley, traverse gold mining fields and a portion of the 800-mile-long trans-Alaska Pipeline. Pass over the Brooks Mountain Range, which is the northernmost section of the Rocky Mountains and the highest mountain range in the Arctic Circle, and visit a wilderness community on the Middle Fork Koyukuk River. Looking for a romantic one-day getaway? Look no further than Alaska’s icy-hot Chena Hot Springs Resort. This resort is home to the Aurora Ice Museum, created from over 1,000 tons of ice and snow. After touring the ice museum, relax at the Ice Bar and enjoy an appletini in an ice-carved martini glass while warming up next to the ice fireplace. Then, indulge in a fabulous dinner of prime rib, halibut or salmon. Finish up your day at Chena Hot Springs by taking a dip in the natural hot springs outdoor rock lake. Take a train ride on the Tanana Valley Railroad and hear stories about the thousands of prospectors who arrived during the gold rush. Travel through a permafrost tunnel, see amazing rock formations and learn about underground mining methods used during the gold rush days. Upon arrival at the El Dorado Gold Mine, learn how to pan for real gold and take a walking tour of the mining camp. Then hop aboard the train and return to the station. Visit the town of North Pole and Santa Claus House, where Christmas is celebrated year-round with a gift shop full of holiday decor, ornaments, apparel and collectibles. Have a picture taken with Prancer and members of Santa’s team of reindeer, Santa’s sleigh and a life-size nativity scene. Dinner is at the Pagoda, a Chinese restaurant featured on the Food Network program “Diners Drive-ins and Dives.” The trip finishes up with a driving tour of the town and the story behind its holiday theme. Enjoy a self-guided tour of the University of Alaska Museum of the North. The museum features nearly 1.4 million artifacts and specimens representing millions of years of biological diversity and thousands of years of cultural tradition. Highlights of the tour include fist-sized gold nuggets, a 36,000-year-old bison mummy, whale skulls and mammoth tusks. For more information on these activities, visit the Fairbanks excursions page or call 1-800-426-0500.